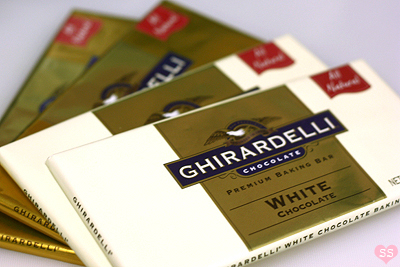 Melt butter and white chocolate together in a microwave and mix. Heat cream in a small saucepan over low heat until simmering. Pour the cream into the white chocolate/butter mixture and combine. Mix in the strawberry puree. 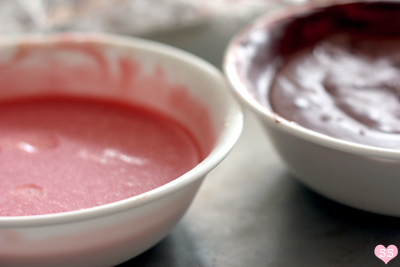 Add a bit of red food coloring if the mixture isn't pink (it depends on how red your strawberries were). Cover the bowl with plastic wrap and place in refrigerator for a few hours. Line a baking sheet with parchment paper. 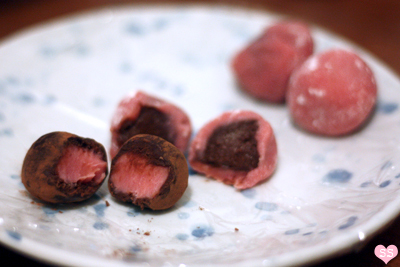 Use a spoon to scoop out ping pong ball sized portions of the strawberry truffle mixture onto the parchment paper. Place the sheet in the freezer for 1-2 hours, until the mixture is firm. Take the tray out and roll each portion into a ball. 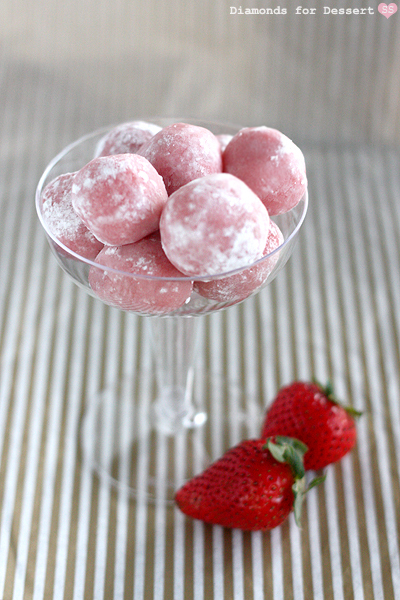 Roll each ball in powdered sugar and serve immediately. If not served immediately, place in an airtight container and keep in freezer until ready to serve (they might need to be re-rolled in powdered sugar when served). Place the chocolate in a heat proof bowl and set aside for now. Heat the cream in a saucepan over low heat until simmering. Pour the cream over the chocolate and mix until all the chocolate is melted. Add the butter and gently mix until all the butter is incorporated. Mix in the champagne. Cover the bowl with plastic wrap and place in refrigerator for a few hours. 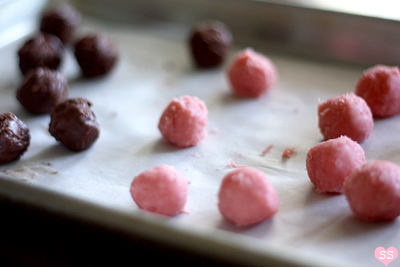 Take the tray out and roll each portion into a ball. 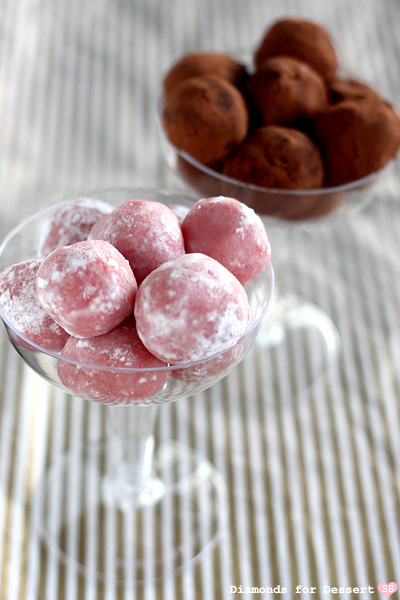 Roll each ball in cocoa powder and serve immediately. If not served immediately, place in an airtight container and keep in freezer until ready to serve (they might need to be re-rolled in cocoa powder when served). After chilling both of the truffle mixtures, line a baking sheet with parchment paper. Use a spoon to scoop out gumball sized portions of both the truffle mixtures (basically 1/2 a ping pong ball sized portions from above) onto the baking sheet. Place the sheet in the freezer for 1-2 hours, until the mixture is firm. Take the tray out and roll half of the portions into balls. Use the other half of the portions to wrap around the balls so you have one truffle flavor on the inside and another on the outside. 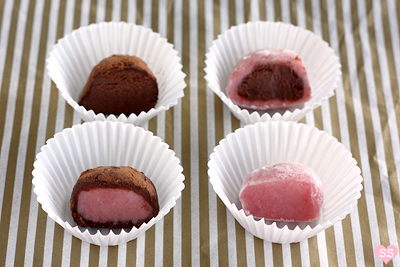 Freeze the tray of wrapped truffles back in the freezer for 1-2n hours, until the truffles are firm. 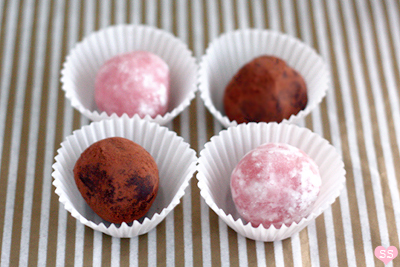 Remove from freezer, roll each truffle in a ball and if the outside layer is strawberry, roll in powdered sugar. 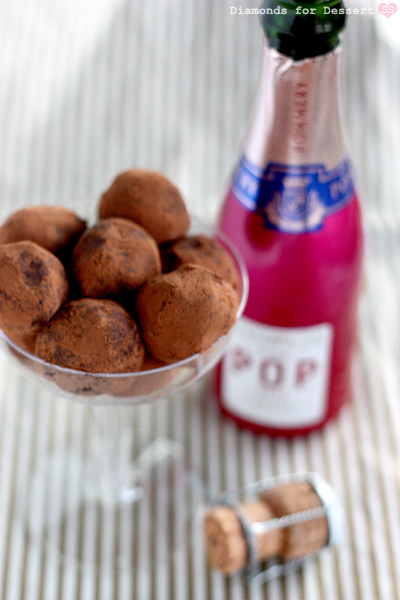 If the outside layer is chocolate champagne, roll in cocoa powder. Serve immediately. If not served immediately, place in an airtight container and keep in freezer until ready to serve (they might need to be re-rolled in cocoa powder or powdered sugar when served). Thanks! Yeah, I was thinking about blog improvements and I realized that after 2 years of blogging, I still don't have an About Me page. i would love to eat them. These are my kind of truffles! They look scrumptious. Yay, I'm glad to hear that the mint choco chip truffles were a hit. Ron Swanson will definitely be a part of my Parks and Rec post. I seriously can't wait for March because of the Hunger Games movie! I'm still thinking about what I want to make as there are so many possibilities. I'm pretty sure bread is a must though since Peeta is the "boy with the bread". Thanks! Yup, I've been also been rereading the Hunger Games books. I think the great thing is that every time I reread a book, I always notice new things that I didn't see before, like a perfectly worded sentence, which only makes me love the books that much more. Thanks! I can't wait to share them with you :). They seem yummy! So...you like Parks & Rec, eh? What about 30 Rock?! :D I loveee Amy Poehler, Kristen Wiig, and of course Tina Fey. how can I combine the strawberry and the champagne together? Im not a fan of chocolate.